AFTER swimming almost 100 miles, cycling for 2,500 miles and running over 600 miles in consecutive triathlons over 100 days, the Editor of Police Professional, Paul Lander, finishes his final Olympic-distance triathlon next Thursday, 7th February at National Memorial Arboretum (NMA) in Staffordshire. After day 83's Lincolnshire Police’s charitable triathlon. Paul with Beth Wilmot, Lee St Quinton, Bill Skelly and Sam Ward wearing hard-earned medals. The 55-year-old from Aylesbury in Buckinghamshire has completed a 1,500m swim, a 40km bike ride and a 10km run every day for the last three months, including Christmas Day, in aid of the new UK Police Memorial to be built at the NMA, to commemorate those officers and staff who have died and been killed on duty. 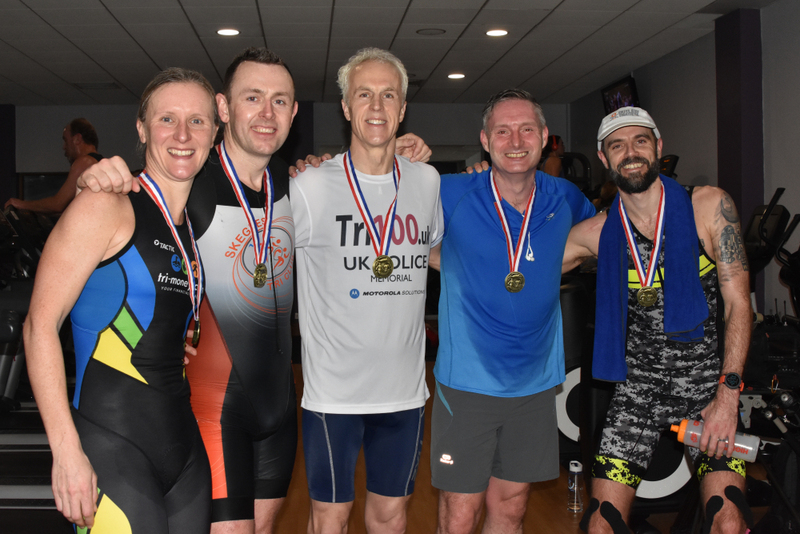 He has taken his challenge across the country where he has completed triathlons with a number of Chief Constables and serving police officers, raising over £10,000 in the process for the Trust. Chair of Trustees, Sir Hugh Orde, said: “Paul needs to be commended for completing this huge challenge for our charity and he should feel justly proud for what he has achieved. While Paul has previously taken part in around 30 triathlons over the last decade, he has never attempted anything so physically demanding as this challenge has been. The extreme nature of such repetitive exercise has taken its toll, from severe knee and calf pain, to losing ten per cent of his body weight and heavy colds and flu during the latter stages. Despite this, Paul has persevered to complete the 100-day challenge, which he started in Westminster on 31st October, the anniversary of the murder of Sergeant John Speed in 1984. Paul Lander said: “John Speed’s death had a big impact on me, but also on the whole of Leeds and brought home how, every day, officers without hesitation step into danger to protect the rest of us. “I have had the opportunity to pay tribute to those who have died on each day of my challenge, and occasionally have been joined by their families, friends and former colleagues. “It has reinforced how important it is to remember the huge sacrifice not only made by police officers and staff when they regularly and selflessly put themselves in danger to come to our assistance, but also their loved ones. Paul’s 100 Day triathlon challenge in support of the new UK Police Memorial will finish at the National Memorial Arboretum in Staffordshire next Thursday, 7th February where he will be greeted by Trustees, representatives of the Trust and supporters. To keep informed about updates to the UK Police Memorial, please follow us on Twitter. Working in partnership with the Police Roll of Honour Trust, Registered Charity No. 1179754 & SC044745. Incorporated by Royal Charter. Copyright © Police Arboretum Memorial Trust. Registered charity number 1159831.